After optimization, we need to select only one of a large variety of parameter sets. There is no clear answer about what criterion to use when selecting such a set: profitability, drawdown, recovery factor or some combination of these or other parameters. But how to evaluate the combination of parameters? In this article we will perform an experiment: we will color optimization results. The color is determined by three parameters: the levels of red, green and blue (RGB). There are other color coding methods, which also use three parameters. Thus, three testing parameters can be converted into one color, which visually represents the values. At the end of this article we will find out if such a representation can be useful. string aFileName is the name of the file with the optimization report. The file must be available in the MQL5/Files folder of the terminal data directory. SOptimization & aOptimization is passed by reference. After the function execution, data extracted from the report will be located in this structure. The structure includes two arrays: string ParameterName and SPass Pass. The names of parameters to be optimized are located in ParameterName. We are mainly interested in the second array SPass: one element of this array contains data about one optimization pass. Parameters — an array with the values of optimized parameters. First of all we will use these parameters. However, the report includes other values and thus we need to provide the possibility to use them. 1. Create the ColorOptimization.mqh file. All functions for the creation of colored reports will be located in this file. Both arrays are of the double type. Nine resulting values will be located in the factor array, i.e. all except Pass (pass numbers) and parameters to be optimized. The values of the optimization parameters are located in the sParameters array. Although all the data are already available in the structure, they are presented in a string format, so we would need to convert them into numbers each time the data is used. The array allows having data in a convenient format. The data structure with data is passed to the function as the first parameter and a new structure is returned by reference as the second parameter. Loop through all optimization passes is performed in the function; also some fields of the structure are copied and for some fields type conversion is performed. The general process is not complicated and can be understood from the function code. The enumeration option values start with zero and are increased by 1 and thus it may not necessary to specify the values. However the values are indicated since it is important to provide matching with the factor array. This will help in avoiding possible errors in further revisions and additions to the program. The report file name is passed to the function as the first parameter and the filled SOptimization2 structure is returned as the second parameter. Now everything is ready for solving the main task of the article. Functions for the creation of the color report will be located in ColorOptimization.mqh. Call of these functions will the performed from a script. 1. Let us create a script ColorOptimization.mq5. 2. Connect ColorOptimization.mqh to ColorOptimization.mq5. 3. Add external parameters to the script. First we will add a property indicating that a properties window exists and then we will add variables. After the function execution, the ColorComponents array in the SPass structures array will be filled with values. 7. If sorting is enabled in external script parameters, we need to calculate the factor for the sorting and perform that sorting. The best optimization pass is the one, during which all parameters combined have the maximum value. 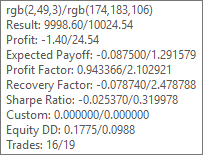 If these parameters correspond to RGB, the best option is the white color. Thus the sorting factor should be calculated as the arithmetic average of three components. Now everything is ready for report creation. The report will consist of two parts. The first one is a copy of the optimization data table with an additional color button (Fig. 1.). The second part consists of several colored planes (tables) for each pair of optimized parameters, each cell will display the gradient reflecting changes in the testing results for the given pair of optimized parameters (Fig. 2). Creation of a table with an additional color indication is performed in the TableContent() function. This function is located in the ColorOptimization.mqh file and returns the HTML code of the table. Creation of a HTML table is a simple task. Color for a color indication cell is set by specifying the cell style, the 'background-color' attribute. Color components ranging between 0 and 1 can be easily converted to components ranging from 1 to 255 by multiplying the values. To provide more visual information in the table, let us add details about what optimization parameter corresponds to this or that color. This data will be specified in the upper cell of the color indicator column, and the upper cells of the parameters will have the appropriate color (Fig. 1). The plane can be drawn when there are two or more optimized parameters. The plane is shown in Fig. 2. The first line shows which parameters correspond to the plane axes: values of Inp_Signal_MACD_PeriodSlow are shown along the X axis (horizontally) and Inp_Signal_MACD_PeriodFast values are displayed along the Y axis. The gradient in the cells shows how the testing results were changing for this pair of values of X and Y parameters when other parameters were changed. The color of the worst value is shown on the left, and that of the best of is on the right. The best and the worst variants are determined based on the previously mentioned sorting factor, which is calculated as the arithmetic mean of the abstract color components. After the execution of this code part, the mxi and mni variables will contain the indices of the best and worst optimization pass. The titles are shown in Fig. 3. The tooltip contains all data about the worst and best optimization pass (the worst / the best). The component values of the RGB gradient are shown in the first line of the tooltip. The gradient display was checked in the following web browsers: Opera, Google Chrome, Yandex browser and Microsoft-Edge. In all of them it works well. I used the HTMLStart() and HTMLEnd() functions from the article Analyzing trading results using HTML reports. The styles file from the same article was slightly changed and renamed to style2.css. The ready files are attached below: ColorOptimization.mqh and the ColorOptimization.mq5 script. Code in ColorOptimization.mqh is structured so that you can easily amend it for a different color model. Let us try to add the CMY color model. For this, we need to perform a few preliminary steps. 1. Copy ColorOptimization.mqh and ColorOptimization.mq5 and save them as ColorOptimization2.mqh and ColorOptimization2.mq5. Now, the color model type can be selected during script launch. The difference between CMY and RGB is than in CMY the best values are shown in black and other colors will also be different (Figures 4, 5). The best options in RGB are close to white and in CMY they are close to black. For a proper interpretation of other colors, we need to understand how individual components within the color model are combined and how the resulting color is formed. Let us view the RGB model in more detail. When the values of all components are equal to 0, we get the black color. When all components are equal to the maximum value, the color is white. All other combinations provide different colors. If one of the components has the highest value, and the other two are equal to 0, we get the clear color of the appropriate component: red, green or blue. If two components have maximum values and the third one is zero, the resulting color is also clear. Red and green result in yellow, green and blue provide cyan, red and blue are shown as magenta. Figure 6 shows several combinations of RGB components. Based on the shade, we can understand which parameters indicator contributes more positively to the testing result. If red, it is the first parameter; if the color is yellow, then the first and second ones; green means the third parameter, etc. Colors in the RGB model are added similarly to colored lights. In the CMY model, values are subtracted from white, so the maximum value of all components corresponds to black. The CMY model is similar to mixing paints: if there are no paints, then we have a white sheet of paper; if you mix too many different paints, you get black color (or rather a dirty color when dealing with real paints). Figure 8. shows the basic combinations of CMY components. Colors in CMY are shifted in comparison with RGB. Here is the interpretation: cyan is the first parameter, blue means the first and the second, magenta stands for the second one, red appears for the second and third values, yellow is used for the third and green is used for the first and third parameters. As you can see, there is no fundamental difference in using RGB or CMY model. The perception of colors is a subjective process and it is therefore difficult to make clear conclusions about the convenience and benefits of the color representation. At least one visual indication, the degree of light (which means closeness to white in RGB), allows evaluating the combination of the three parameters. This can simplify the report analysis. When the selection is automated, like in this article, the decision based on a sorted table is made in accordance with the arithmetic mean of the three values. This can be considered the first step into the area of fuzzy logic, using which the final value can be calculated not as a simple arithmetic mean, but in a more complex way. However, we need more practical experimenting to evaluate the effectiveness of this method. ColorOptimization2.htm — file with the report obtained through the ColorOptimization2.mq5 script (the CMY color model). Style2.css — file with styles for the reports created by ColorOptimization.mq5 and ColorOptimization2.mq5. All the files except reports created by the scripts, are arranged in folders as they should be located in the terminal folders. Open the terminal data folder and copy the MQL5 folder into it. In the previous article, we analyzed 14 patterns selected from a large variety of existing candlestick formations. It is impossible to analyze all the patterns one by one, therefore another solution was found. The new system searches and tests new candlestick patterns based on known candlestick types. The article presents a simple and fast method of creating graphical windows using Visual Studio with subsequent integration into the Expert Advisor's MQL code. The article is meant for non-specialist audiences and does not require any knowledge of C# and .Net technology.